Grisly, bloody gore is so important to Killing Floor 2 that Tripwire Interactive developed an entire system for it: M.E.A.T. The studio’s latest dev diary peels back the flesh and reveals how it all works. It’s inspired by Soldier of Fortune, which gives some idea of how unabashedly violent it is. Twenty two. 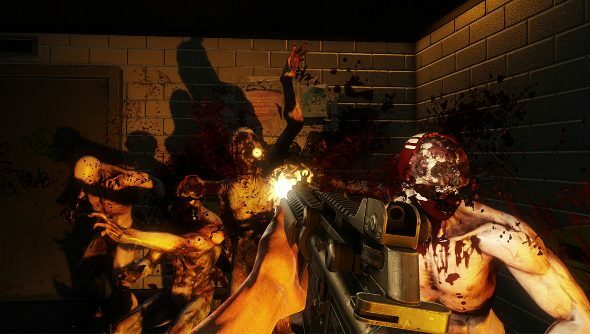 That’s the number of dismemberment points on Killing Floor 2’s horrific zed enemies. “Pretty much just about any piece of the body that you shoot, you can blow off,” says creative director William Munk. A head alone can be blown up into five different bits. A couple of chunks blown off will reveal the skull, and a few more will turn the skull into nothing but blood and viscera. Chucking a grenade under a zed takes things even further, obliterating their body, leaving nothing but slippery organs smeared across the ground. That’s when you can play football with a zombie brain. Lovely.